Ric Addy owns Shake, Rattle and Read, a 45-year-old record and bookstore in Chicago's Uptown neighborhood. Each day, familiar faces from the neighborhood pass through his store. But that diverse mix is starting to change as the neighborhood's landscape is changing with gentrification. 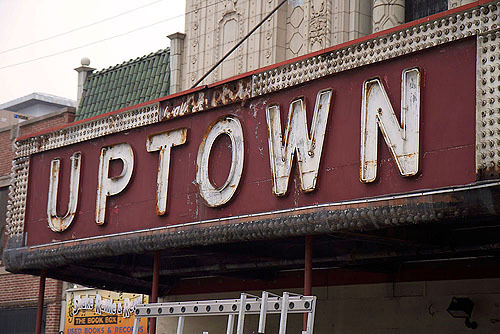 A 2008 study by the Chaddick Institute at DePaul University combining ethnicity, income and age found that Uptown was the most diverse neighborhood in Chicago. “We have a lot of diversity in the type of people who live here, which is a good thing,” said Bill Petty, president of Buena Park Neighbors (BPN), a resident’s organization. Petty moved to Uptown two years ago from Nebraska. Aqueela Ali, a tenant leader with the Northside Tenant Action Coalition (NTAC) who’s lived in Uptown for 33 years, said there are 72 different ethnicities represented in her building alone. She credited this for shaping the way her children learned to appreciate different people. A 2006 study by the Voorhees Center at the University of Illinois Chicago classified Uptown in early to mid-stage gentrification. This type of area is marked by a decrease in low-income households and subsidized housing. Lakeview, directly to the south, is classified as gentrifying, showing an increase in high-income households and a decrease in minorities. According to the U.S. Census, the white population in Uptown has increased from 39 percent to 42 percent from 1990 to 2000. The median household income went from $22,378 to $36,306. The median house value changed from $137,800 to $270,300. In Lakeview, where the process has progressed further, the white population increased from 75 percent to 80 percent between 1990 and 2000 (it was 68 percent in 1980). The median household income grew from $45,981 to $84,458, and the median home value went from $192,300 to $392,967. Uptown resident Aqueela Ali said that all the cultures and incomes have lived in “friendly co-existence” over the years, but that many newcomers have an “us against them” mindset. She said they are concerned with their “condos and their dogs” and don’t interact much with long-time residents. Uptown now has two new aldermen (in wards 46 and 48). The prior alderman of the 46thward, Helen Shiller, was a controversial figure in the neighborhood. She was known for backing projects supporting low-income residents, including subsidized housing. Petty said that people weren’t able to work with Shiller and BPN plans on working closely with the new alderman, James Cappleman. Ali said it was Shiller who kept Uptown as diverse as it is and “tried to hear all the voices,” but residents with their own agenda often vilified her. She has hope that Cappleman wants to help everybody in the neighborhood. Addy said he thinks the new aldermen should start with the obvious problem of gang activity in the area. “It’s like TV, but they’re really shooting,” he said. Said Petty, “Subsidized housing is always a problem.” According to Petty, some buildings in Uptown, like Wilson Yard, are managed very well. But others, where landlords don’t screen tenants and people take advantage of the building, crime escalates. Ali said there have always been gangs in Uptown, but they have become worse. In the 1980s she and other parents mobilized against them, and still work to find other activities to occupy neighborhood children. “It’s not acceptable to us either,” she said of older residents. Petty said BPN members will be working aggressively with Cappleman to “go after the troubled buildings.” He said the more homeowners and families move in, the less room there will be for gangs. “I’d like to see all the storefronts filled with people,” Petty said. Addy said that several new businesses have opened on Broadway recently, and new mayor Rahm Emanuel has talked about making Uptown into an entertainment district for live music. Addy helped to organize Uptown’s first neighborhood festival, Riv Fest, last summer.